Practically all karateka practise kata; however, most only practise the initial stage and therefore they do not develop a rounded and more complete understanding of what kata has to offer. In this article we shall discuss all four stages of kata practise. The first stage is the practise of the solo form and is what most people think of when they talk about kata practise. The first thing that a karateka learns is the actual physical sequence of the kata; the body mechanics required for maximum efficiency; the correct mental attitude etc. This is a very important stage of kata practise. If you are unable to perform the movements of the form in an efficient way when there is no opponent present, you will have absolutely no chance of being able to make those same techniques work when an aggressive opponent is trying to cause you physical harm! The initial stage of solo performance is often where kata practise begins and ends in many modern dojos. One of the main reasons for this is that the criteria used for determining the quality of a kata is frequently just its visual appearance. If the kata looks good, then it is good! This is obviously a flawed way to view kata when you consider that the katas are supposed to have a functional and pragmatic purpose. To my mind, it is better to judge a kata against its pragmatic use; if the karateka can successfully apply the techniques of the kata, then their kata is good, regardless of what it looks like. Please don't misunderstand me; I'm in no way saying that poor solo performance is acceptable, just that the goal should always be function as opposed to appearance. A functional kata will often be striking to the eye, but the aesthetics of the kata are essentially an irrelevant by-product rather than the whole purpose of kata training. Gichin Funakoshi (the founder of Shotokan karate) in his book 'Karate-Do Kyohan' stated, "Once a form has been learned, it must be practised repeatedly until it can be applied in an emergency, for knowledge of just the sequence of a form in karate is useless ". Although the solo performance of a kata is very important, it should not be viewed as the entirety of kata practise. As Funakoshi himself said, unless you can actually apply the techniques of the kata in an emergency, simply knowing how to perform the solo sequence is " useless ". We need to be sure we progress our training onto the subsequent stages. The second stage of kata practise is to study the functional application of the movements of the kata (bunkai). You need to practise applying the techniques of the kata with your practise partners. At this point it is probably worth pointing out the important distinction between realistic bunkai and the more common long range, choreographed karateka vs. karateka battles that are so often seen. The katas were never designed for fighting other karateka; they were intended to be a record of realistic techniques for use in a civilian environment (self-protection). In real situations, people do not assume a stance and then execute an oi-zuki from ten-feet away! If we accept that kata were designed for use in real situations, then we must also accept that in a real situation we are very unlikely to face a fellow karateka, especially one who executes their techniques in such a contrived and formal manner (you can thank your lucky stars if you ever did!). The applications of the kata should be simple, close-range and not dependant on the attacker performing certain actions in a certain way. An analogy I like to use to explain how a form records a complete system is that of an acorn and an oak tree (my apologies to those who've heard this before :-). An oak tree is vast, both in terms of its size and years lived, but everything about that tree, and everything required to reproduce it, is found in a single acorn. A fighting system produces a kata in the same way that an oak tree produces acorns. Both the acorn and the kata are not as vast as the thing that created them, but they record them perfectly. For an acorn to become an oak tree it must be correctly planted and nurtured. For a kata to become a fighting system it must be correctly studied and practised. It is here that we find one of modern karate's biggest failings, in that the katas are rarely studied sufficiently. To return to my analogy, we have the seeds but we don't plant them! Hironori Otsuka (founder of Wado-Ryu karate) once wrote; " It is obvious that these kata must be trained and practised sufficiently, but one must not be 'stuck' in them. One must withdraw from the kata to produce forms with no limits or else it becomes useless. It is important to alter the form of the trained kata without hesitation to produce countless other forms of training. Essentially, it is a habit - created over long periods of training. Because it is a habit, it comes to life with no hesitation - by the subconscious mind. " ('Wado-Ryu Karate' page 19-20). I believe that Otsuka is telling us to practise varying the applications of the kata or else we run the risk of being 'stuck' in the form and hence becoming limited fighters. We need to follow Otsuka's advice and practise so that the form can be utilised, without hesitation, in any situation in which we should find ourselves. 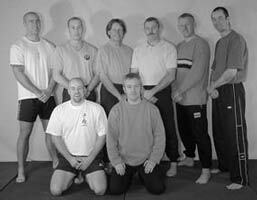 Katas express good examples of the core principles of the combative system that is being recorded. Katas do not record every single technique, combination and variation in the entire system! How could they? So to get the most out of kata we need to practise varying the techniques of the kata whilst staying true to the principles that the techniques represent. This is the third stage of kata practise. The fourth and most neglected stage is to practise applying the techniques, variations and principles of the kata in live practise. The only way to ensure that you will be able to utilise techniques in a live situation is to practise your techniques in live situations. You need to engage in live any-range sparring if you are to make your kata practise worthwhile. No amount of solo practice or drilling the techniques with a compliant partner will give you the skills needed to apply what you have learnt in a live situation. In recent years we have seen more and more karateka begin to include bunkai practise in their training. And whilst this is to be applauded, it is of little use unless we take things one step further and engage in kata-based sparring (see my books 'Bunkai-Jutsu' and 'Karate's Grappling Methods' for further details). Live sparring and the solo performance of a kata may look radically different, but they are essentially exactly the same. As an analogy, think of a kata as being like a block of ice. The shape of the block of ice is constant. However, if heat is added, the ice will turn into water and its shape will adapt to fit its circumstances. Likewise, a kata also is constant, but in the heat of combat it will also adapt to its circumstances. The block of ice and the free flowing water may look very different, but they are essentially identical (the same molecules of hydrogen and oxygen). In the same way, a form will often look different to the techniques being applied in an ever-changing live fight, but they are also essentially identical (the same fighting principles). Although the four stages of kata practise may look different, it is vital that you understand that all of them are identical at their core. All four stages are 'kata', not just the solo performance. Whilst a student would initially start at stage one and progress to stage four, it should be remembered that the preceding stages should not be abandoned and they must also be practised. Stage four practise is undoubtedly the most realistic; however, you should not abandon the other three stages when you are competent enough to engage in kata-based sparring. The practise of the solo form will allow you to refine technique, visualisation and mental attitude without the pressure induced by an opponent (it's also a good way to train on the days where your partners are unable to get to training). The practise of the bunkai (stage two) and variations (stage three) will also help you to improve technique. You will also become a more versatile fighter as your understanding of the kata's core principles improves through stage three training. Conversely, as your ability to apply the techniques of the kata in live practise increases, so will the quality of your solo form as the kata will become more meaningful and mentally intense. The katas truly are works of genius that have a great deal to offer the pragmatically minded karateka. To unlock the whole of what kata has offer, you need to practise your katas in their entirety. Whilst the solo aspect of the form is very important, it only represents the first initial stage. It is only when you move beyond the solo form onto the subsequent stages that is becomes apparent how pragmatic and holistic karate can be. I'll close by thanking you for taking the time to read this article; I sincerely hope that you found it useful.